The challenges for both cell phone users and TV crews using portable cellular 3G/4G LTE uplink systems are similar. In harsh wireless environments like sports stadiums on game day, dense urban centers, and remote or rural areas, achieving sufficient bandwidth connections for reliable, live HD transmission is not without its challenges. There is a solution. As any owner of a smart phone will understand, cell bandwidth can vary wildly depending upon variables such as the cell provider, use location and the number of other smart phone users in the area. The challenges are no different for portable cellular 3G/4G LTE uplink systems used by broadcasters for newsgathering. In harsh wireless environments like sports stadiums on game day, dense urban centers, and remote or rural areas, achieving sufficient bandwidth connections for reliable, live HD transmission is not without its challenges. Dedicated satellite and microwave links provide alternative transmission methods but also have limitations. A satellite or microwave vehicle may not be able to reach the desired location due to road access restrictions. If a vehicle can be deployed, factors such as limited line-of-sight, rain fade, or even nearby buildings can impair the signal and weaken the transmission quality. The TVUPack mobile cellular uplink backpack introduces a way to increase the reliability of live video transmission within these challenging environments. By using integrated MIMO MESH microwave radios or MESH nodes together with TVU Network’s proprietary Inverse StatMux Plus IP video technology, an additional IP connection together with cellular, Wi-Fi, Ethernet, etc. is added locally to relay packets from the field location to the news operations center. Since MIMO nodes are IP-based, the transmitter aggregates the MIMO connection with all other available cellular modem connections, establishing greater resilience for live video transmission. MESH radio nodes utilize MIMO (Multiple-In and Multiple-Out) antennas in a 4x4 or 2x2 configuration .Nodes are small, lightweight devices that are easily attached to fixed locations such as the sides of buildings. The nodes are both self-forming and self-healing, which means nodes can be added or removed at any time, and the system will automatically adapt to maintain persistence. Nodes are typically plug-and-play, requiring no configuration. When more nodes are added, the transmission range is increased without the need for line of sight between the nodes. Within dense urban environments, MIMO transmission and the self-forming / self-healing nature of the solution provides the ability to transmit around large obstructions. 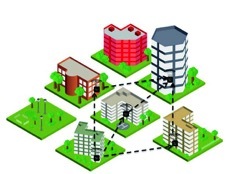 When multiple nodes are placed near each other, a MIMO MESH network is created in which data streams are passed between all nodes in the network. The transmission range of individual nodes is typically up to one mile. Since the mesh network is self-forming and self-healing, the system automatically and optimally manages and routes the data transmitted from the TVUPack transmitter to a TVU receiver at the news station. Adding more nodes easily extends the network. TVUPack with MIMO supports high definition video with very low latency in transmission hops between nodes. As such, TVUPack with MIMO is well suited for live broadcast. MIMO works in both licensed and unlicensed bands. In addition, the video transmission is delivered using Inverse StatMux Plus or IS+. With IS+, the video stream is separated into many small packets. 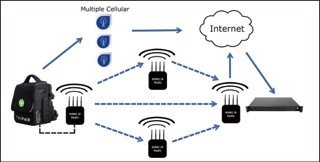 The packets are transmitted through multiple connections such as cellular modems and MIMO nodes, according to the data rate of each connection’s throughput. The packets are then reassembled or aggregated at the TVU receiver end in the news operations center. IS+ uses an advanced forward error correction algorithm that does not introduce the latency often associated with packet retransmission. Transmission pathways for TVU transmitter to receiver using MIMO MESH. The addition of an integrated TVU and MIMO MESH solution to any newsgathering operation provides significantly enhanced reliability and flexibility.